Unfortunately, the problems associated with entity resolution are equally big --- as the volume and velocity of data grow, inference across networks and semantic relationships between entities becomes increasingly difficult. Data quality issues, schema variations, and idiosyncratic data collection traditions can all complicate these problems even further. When combined, such challenges amount to a substantial barrier to organizations' ability to fully understand their data, let alone make effective use of predictive analytics to optimize targeting, thresholding, and resource management. Let us first consider what an entity is. Much as the key step in machine learning is to determine what an instance is, the key step in entity resolution is to determine what an entity is. Let's define an entity as a unique thing (a person, a business, a product) with a set of attributes that describe it (a name, an address, a shape, a title, a price, etc.). That single entity may have multiple references across data sources, such as a person with two different email addresses, a company with two different phone numbers, or a product listed on two different websites. If we want to ask questions about all the unique people, or businesses, or products in a dataset, we must find a method for producing an annotated version of that dataset that contains unique entities. How can we tell that these multiple references point to the same entity? What if the attributes for each entity aren't the same across references? What happens when there are more than two or three or ten references to the same entity? Which one is the main (canonical) version? Do we just throw the duplicates away? Each question points to a single problem, albeit one that frequently goes unnamed. Ironically, one of the problems in entity resolution is that even though it goes by a lot of different names, many people who struggle with entity resolution do not know the name of their problem. Deduplication: eliminating duplicate (exact) copies of repeated data. Record linkage: identifying records that reference the same entity across different sources. Canonicalization: converting data with more than one possible representation into a standard form. Entity resolution is not a new problem, but thanks to Python and new machine learning libraries, it is an increasingly achievable objective. This post will explore some basic approaches to entity resolution using one of those tools, the Python Dedupe library. In this post, we will explore the basic functionalities of Dedupe, walk through how the library works under the hood, and perform a demonstration on two different datasets. Dedupe is a library that uses machine learning to perform deduplication and entity resolution quickly on structured data. It isn't the only tool available in Python for doing entity resolution tasks, but it is the only one (as far as we know) that conceives of entity resolution as it's primary task. In addition to removing duplicate entries from within a single dataset, Dedupe can also do record linkage across disparate datasets. Dedupe also scales fairly well --- in this post we demonstrate using the library with a relatively small dataset of a few thousand records and a very large dataset of several million. Effective deduplication relies largely on domain expertise. This is for two main reasons: first, because domain experts develop a set of heuristics that enable them to conceptualize what a canonical version of a record should look like, even if they've never seen it in practice. Second, domain experts instinctively recognize which record subfields are most likely to uniquely identify a record; they just know where to look. As such, Dedupe works by engaging the user in labeling the data via a command line interface, and using machine learning on the resulting training data to predict similar or matching records within unseen data. Getting started with Dedupe is easy, and the developers have provided a convenient repo with examples that you can use and iterate on. Let's start by walking through the csv_example.py from the dedupe-examples. To get Dedupe running, we'll need to install unidecode, future, and dedupe. Let's imagine we own an online retail business, and we are developing a new recommendation engine that mines our existing customer data to come up with good recommendations for products that our existing and new customers might like to buy. Our dataset is a purchase history log where customer information is represented by attributes like name, telephone number, address, and order history. The database we've been using to log purchases assigns a new unique ID for every customer interaction. But it turns out we're a great business, so we have a lot of repeat customers! We'd like to be able to aggregate the order history information by customer so that we can build a good recommender system with the data we have. That aggregation is easy if every customer's information is duplicated exactly in every purchase log. But what if it looks something like the table below? How can we aggregate the data so that it is unique to the customer rather than the purchase? Features in the data set like names, phone numbers, and addresses will probably be useful. What is notable is that there are numerous variations for those attributes, particularly in how names appear --- sometimes as nicknames, sometimes even misspellings. What we need is an intelligent and mostly automated way to create a new dataset for our recommender system. Enter Dedupe. Dedupe scans the data to create tuples of records that it will propose to the user to label as being either matches, not matches, or possible matches. These uncertainPairs are identified using a combination of blocking , affine gap distance, and active learning. Records are then grouped, or blocked, by matching predicates so that only records with matching predicates will be compared to each other during the active learning phase. The blocks are developed by computing the edit distance between predicates across records. 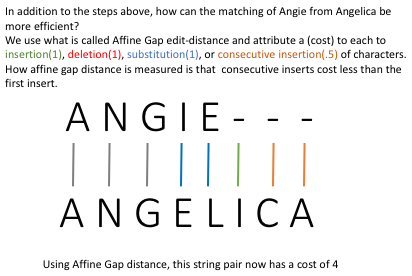 Dedupe uses a distance metric called affine gap distance, which is a variation on Hamming distance that makes subsequent consecutive deletions or insertions cheaper. Therefore, we might have one blocking method that groups all of the records that have the same area code of the phone number. This would result in three predicate blocks: one with a 202 area code, one with a 334, and one with NULL. There would be two records in the 202 block (IDs 452 and 821), two records in the 334 block (IDs 233 and 699), and one record in the NULL area code block (ID 720). The relative weight of these different feature vectors can be learned during the active learning process and expressed numerically to ensure that features that will be most predictive of matches will be heavier in the overall matching schema. As the user labels more and more tuples, Dedupe gradually relearns the weights, recalculates the edit distances between records, and updates its list of the most uncertain pairs to propose to the user for labeling. Once the user has generated enough labels, the learned weights are used to calculate the probability that each pair of records within a block is a duplicate or not. In order to scale the pairwise matching up to larger tuples of matched records (in the case that entities may appear more than twice within a document), Dedupe uses hierarchical clustering with centroidal linkage. Records within some threshold distance of a centroid will be grouped together. The final result is an annotated version of the original dataset that now includes a centroid label for each record. You can see that dedupe is a command line application that will prompt the user to engage in active learning by showing pairs of entities and asking if they are the same or different. You can experiment with typing the y, n, and u keys to flag duplicates for active learning. When you are finished, enter f to quit. As you can see in the example above, some comparisons decisions are very easy. The first contains zero for zero hits on all four attributes being examined, so the verdict is most certainly a non-match. On the second, we have a 3/4 exact match, with the fourth being fuzzy in that one entity contains a piece of the matched entity; Ryerson vs. Chicago Public Schools Ryerson. A human would be able to discern these as two references to the same entity, and we can label it as such to enable the supervised learning that comes after the active learning. A different combination of attributes would result in a different blocking, a different set of uncertainPairs, a different set of features to use in the active learning phase, and almost certainly a different result. In other words, user experience and domain knowledge factor in heavily at multiple phases of the deduplication process. In order to try out Dedupe with a more challenging project, we decided to try out deduplicating the White House visitors' log. Our hypothesis was that it would be interesting to be able to answer questions such as "How many times has person X visited the White House during administration Y?" However, in order to do that, it would be necessary to generate a version of the list that contained unique entities. We guessed that there would be many cases where there were multiple references to a single entity, potentially with slight variations in how they appeared in the dataset. We also expected to find a lot of names that seemed similar but in fact referenced different entities. In other words, a good challenge! The data set we used was pulled from the WhiteHouse.gov website, a part of the executive initiative to make federal data more open to the public. This particular set of data is a list of White House visitor record requests from 2006 through 2010. Here's a snapshot of what the data looks like via the White House API. Download the dataset from the webpage. Once downloaded, we can clean it up and load it into a database for more secure and stable storage. The other challenge with our dataset are the numerous missing values and datetimeformatting irregularities. We wanted to be able to use the datetime strings to help with entity resolution, so we wanted to get the formatting to be as consistent as possible. The following script handles both the datetime parsing and the missing values by combining Python's dateutil module and PostgreSQL's fairly forgiving 'varchar' type. This function takes the csv data in as input, parses the datetime fields we're interested in ('lastname','firstname','uin','apptmade','apptstart','apptend', 'meeting_loc'. ), and outputs a database table that retains the desired columns. Keep in mind this will take a while to run. For our deduplication script, we modified the PostgreSQL example as well as Dan Chudnov's adaptation of the script for the OSHA dataset. We observed a lot of uncertainty during the active learning phase, mostly because of how enormous the dataset is. This was particularly pronounced with names that seemed more common to us and that sounded more domestic since those are much more commonly occurring in this dataset. For example, are two records containing the name Michael Grant the same entity? Additionally, we noticed that there were a lot of variations in the way that middle names were captured. Sometimes they were concatenated with the first name, other times with the last name. We also observed what seemed to be many nicknames or that could have been references to separate entities: KIM ASKEW vs. KIMBERLEY ASKEW and Kathy Edwards vs. Katherine Edwards (and yes, dedupe does preserve variations in case). On the other hand, since nicknames generally appear only in people's first names, when we did see a short version of a first name paired with an unusual or rare last name, we were more confident in labeling those as a match. Other things that made the labeling easier were clearly gendered names (e.g. Brian Murphy vs. Briana Murphy), which helped us to identify separate entities in spite of very small differences in the strings. Some names appeared to be clear misspellings, which also made us more confident in our labeling two references as matches for a single entity (Davifd Culp vs. David Culp). There were also a few potential easter eggs in the dataset, which we suspect might actually be aliases (Jon Doe and Ben Jealous). What we realized from this is that there are two different kinds of duplicates that appear in our dataset. The first kind of duplicate is one that generated via (likely mistaken) duplicate visitor request forms. We noticed that these duplicate entries tended to be proximal to each other in terms of visitor_id number, have the same meeting location and the same uin (which confusingly, is not a unique guest identifier but appears to be assigned to every visitor within a unique tour group). The second kind of duplicate is what we think of as the frequent flier --- people who seem to spend a lot of time at the White House like staffers and other political appointees. During the dedupe process, we computed there were 332,606 potential duplicates within the data set of 1,048,576 entities. For this particular data, we would expect these kinds of figures, knowing that people visit for repeat business or social functions. In this beginners guide to Entity Resolution, we learned what it means to identify entities and their possible duplicates within and across records. To further examine this data beyond the scope of this blog post, we would like to determine which records are true duplicates. This would require additional information to canonicalize these entities, thus allowing for potential indexing of entities for future assessments. Ultimately we discovered the importance of entity resolution across a variety of domains, such as counter-terrorism, customer databases, and voter registration. Please return to the District Data Labs blog for upcoming posts on entity resolution and discussion about a number of other important topics to the data science community. Upcoming post topics from our research group include string matching algorithms, data preparation, and entity identification! Cleaning up raw data makes it easier to interpret and analyze key findings for your business. Schedule a free consultation to find out how we can help!